“It’s a line from a famous song: Smells good, smells like Lisbon” Nunu, our guide was unaware he was preaching to the converted. It wasn’t only the smells that had drawn me into this city that I’d known nothing about only days before, but the whole kit and caboodle. In fact, some of the smells weren’t even that great, but I’ll get to that. I focused on the tiles of pale sandstone and deep grey granite that shone under my weary feet, as I concentrated hard on the rest of Nunu’s words. Like most locals we had met thus far, his English was impeccable and he rattled along an easy tangent about the greatest crime in Portugal: “The bankers can take our money, they can ruin our economy, but if you steal laundry from our washing lines, it’s straight to prison!” Our group of anorak-clad strangers chuckled and got lost in his tales once more. Looking upward to the slender, well-renovated buildings of the Baixo Alto, fresh sheets on wires outside windows, blue and white tiles framing doorways, I ended up back at the ground. The perfectly patterned pavements of Portugal are a resounding feature of my time there. 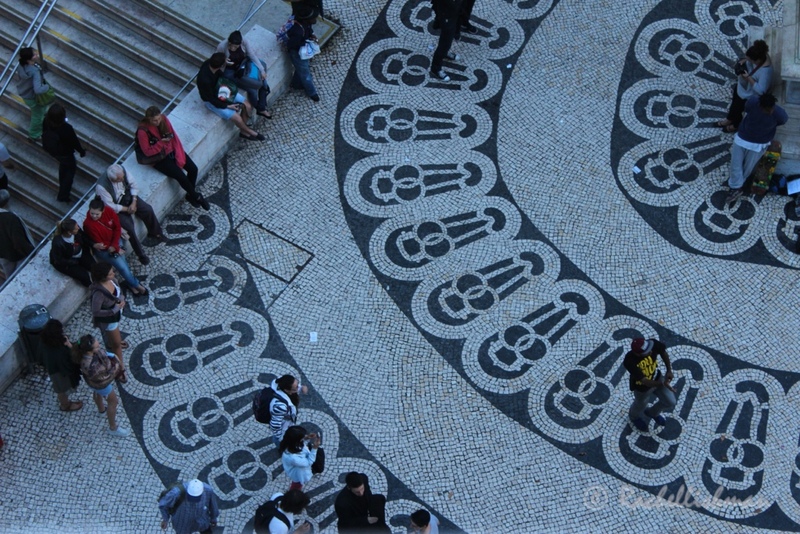 Their geometric angles, elegant swirls and occasionally dizzying cobbles will always remind me of Lisbon. My only dip into this country before my recent weekend away was quite literally a dip into the Algarve. Sheltered by family, an all-inclusive resort and the general ignorance of being a teenager, I hadn’t paid any attention to Portugal itself. So I arrived in Lisbon with a vague recollection of my father’s love of grilled sardines, a notion that the sun always shone and a more recent news snippet regarding economic woes since the Global Financial Crisis. I also assumed that the Portuguese would be very similar in character to the Spanish. I realize now that was akin to casting the Welsh as English and vice versa, which everyone knows is a cardinal sin. Given that I spent a year living less than four hours’ drive from the Portuguese border, my ignorance was astounding and embarrassing. I was very pleased then, that like all silly people who form cultural stereotypes and tar whole nations with one sweeping brush stroke, I was firmly put in my place. The sun didn’t always shine. Lisbon, less like Spain and more like Germany, with the efficiency of its public transport system and orderly streets that unraveled towards the mouth of the Tagus River, surprised me greatly. Within roughly an hour, I was in love. It seemed to me that the city had accidentally on-purpose acquired all the best bits of Europe and bettered them. They were thrown together into bite size distances for even the laziest visitor: Provence’s shaded cafes, at half the price; Berlin’s competent trams that doubled as working artifacts of the industrial revolution; London’s quirky street art, with a Latin-American twist; the Moorish castles of southern Spain, with less barriers to touch and last but not least, Italy’s church frescos in high definition. Proof that the sun doesn’t always shine! 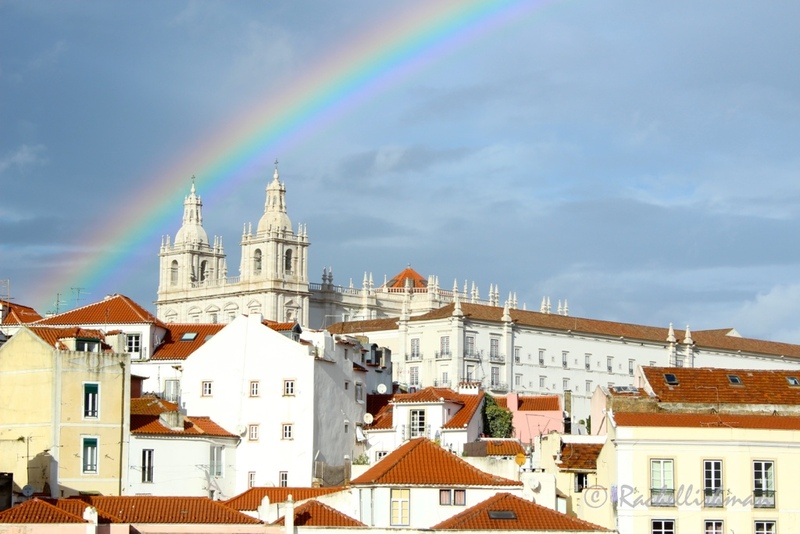 Storm clouds recede behind a stunning rainbow at one of Alfama’s look-outs. The reason that Lisbon’s success is so astonishing? In 1755 eighty percent of this capital was reduced to rubble. Approximately two thirds of the population perished. It was the perfect storm; On All Saint’s Day in the middle of morning mass, a 9.0 magnitude earthquake struck that lasted several minutes. The locals cowering in the naves of massive churches didn’t stand a chance as the giant stonework fell around them. The quake caused fires in houses where candles had been left burning, and shortly afterward, a tsunami followed. The rebuilders of Lisbon, predominantly led by the Marquis of Pombal, had impressive foresight. They built wider avenues and larger plazas, made all streets cobbled to absorb future tremors and lovingly restored the medieval churches, knowing that one day, they would still be part of the country’s cultural heritage. They did a great job. 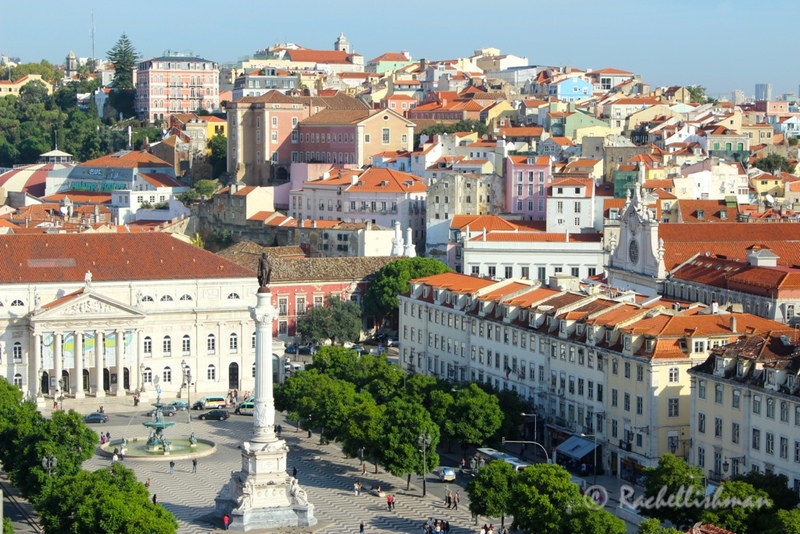 Lisbon transforms into a handful of distinct towns as you stroll. From the ancient Moorish district of Alfama on the eastern hill that mostly withstood the disaster of 1755, through the flat and grid-like 18th century Rossio with its impressive arches and statues, to the western slopes of Chiado and the Baixo Alto, where restored narrow streets unwind off small squares that smell of roasted chestnuts and occasionally…sewer. I got to it. However, I’m not convinced by Nunu’s claim of part-time brilliance. I have a sneaking suspicion that this city is a full-time phenomenon. *Nunu was part of Chill Out Tours – a free walking city tour that is delivered by wonderfully enthusiastic locals. The best bit? You pay afterwards whatever you think it was worth! Very interesting reading about the history I have learnt about Lisbon now, and the photos were great!